Organisational behaviour is an interdisciplinary approach to human behaviour at work. It integrates relevant knowledge drawn from the related disciplines of psychology, sociology and anthropology to make them applicable for studying and analysing organisational behaviour. It studies the impact of individuals, groups, and structures have on human behaviour psychology within organisations, the interface between human behaviour and the organisation and the organisation itself. It looks at the impact of these within an organisation through the lens of the disciplines of strategy, culture, leadership and change, talent management, work and organisational psychology and coaching and mentoring. Knowledge about human behaviour would be useful in improving an organisation’s effectiveness. 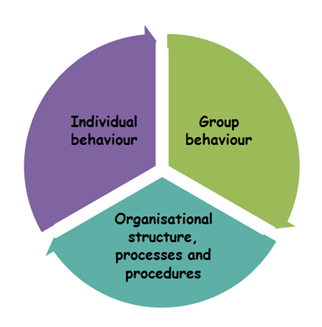 Combining the above three features, organisation behaviour can be understood to be the study of human behaviour in organisational settings, of the interface between human behaviour and the organisation and of the organisation itself. Aswathappa, K. and Reddy, G.S., 2009. Organisational behaviour (Vol. 20). Himalaya Publishing House. Total Focus offers a suite of strategy, leadership and change, talent management, work and organisational psychology and coaching and mentoring solutions through training, coaching, workshops and facilitation.